We started our journey to homesteading in midsummer of last year. As we keep working and planning, things just seem to get crazier and crazier. At the first of the year, we bought our land. 18 rugged acres with nothing but a creek, some young trees, and a ton of briars. We started working. We started some clearing for the driveway (1000 feet or so) and the area for the eventual house and barn. We have a 3.5 hour drive from where we live to the farm, so not too far but not around the corner either. A problem we ran into was time. We both work full time jobs AND run a moderately successful online etsy shop. That means on a handful of days a month to drive up and work on the farm. Tent camping up there was really a pain, so we tended to settle on day trips. 3.5 hours up…work until dark…then drive 3.5 hours back. Long days for sure. We kept exploring the possibilities for some sort of structure for overnighting. 1. 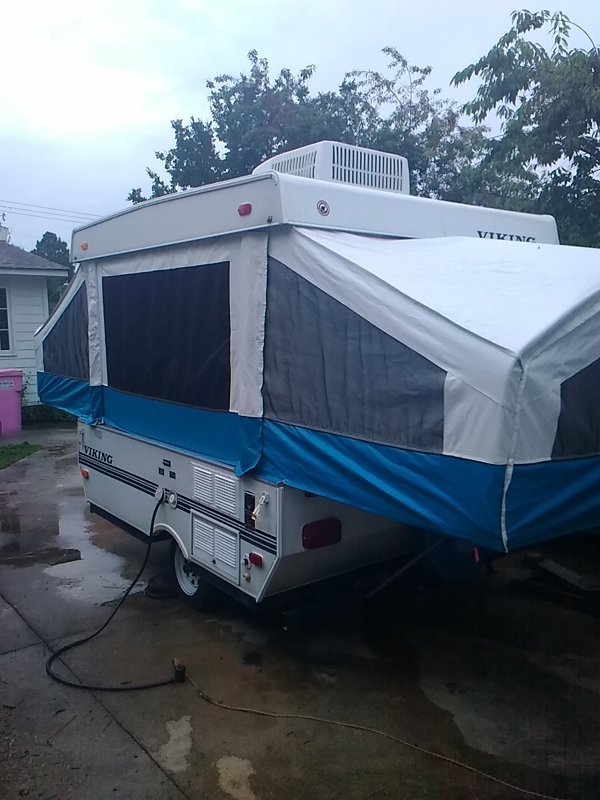 A good used pop up camper. 3. A full setup to run the pop up on solar. 4. A 2004 Ford f150 xlt. To end up with all of these Maria and I had to drive from the coast of North Carolina to just south of Chicago and back in two days off of work. I felt like we were in a bad remake of Smokey and the Bandit. We had a long way to go and a short time to get there. Well, we made it and we’ve got a pile of resources for the farm now. A huge windfall, but crazy and overwhelming. I don’t have a photo of the truck yet, but you’ll see it soon. A good (and not so crazy) thing that happened on this trip was that we had the opportunity to stop at the farm for just a bit. Those briars that we have been fighting and cussing since the beginning of January are covered in berries. We are super excited about the berries. 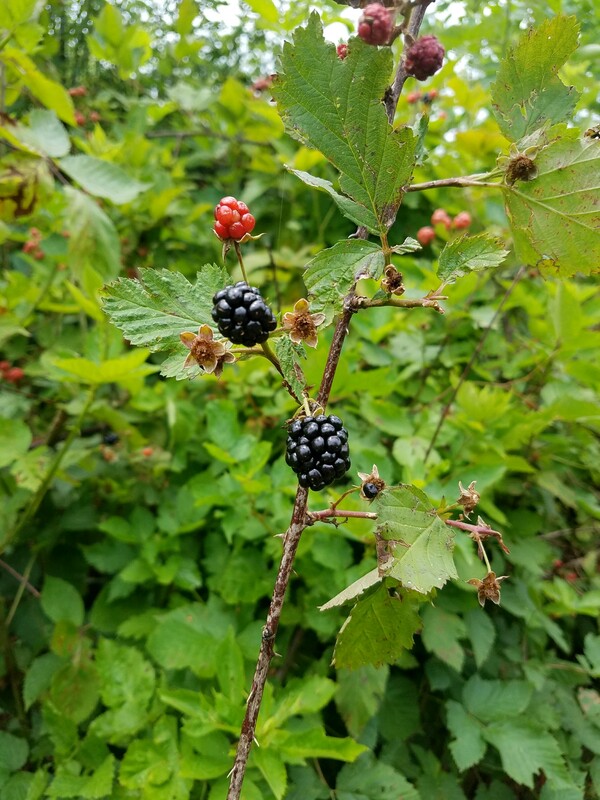 So, on the next trip, as I get a good spot cleared and leveled for the camper, Maria plans on picking as many berries as she can carry. She’s planning on canning and making jam to fill her extensive mason jar collection. I think that she will have plenty as about 15 out of 18 acres are absolutely covered with vines. So this week we’ve had a bunch of crazy and then some berry picking. We hope that you all have a wonderful week, and if it turns crazy we hope its the productive crazy. Enjoy life and just hang on for the ride. For those of you who create, whether that’s painting, sculpting, sewing, smithing…anything really, what is your “signature style”? As I watched a couple of seasons of the History Channel show “Forged In Fire” I kept hearing that phrase for the first round of competition in nearly every episode. The blacksmiths were told to create a blade in their “signature style”. 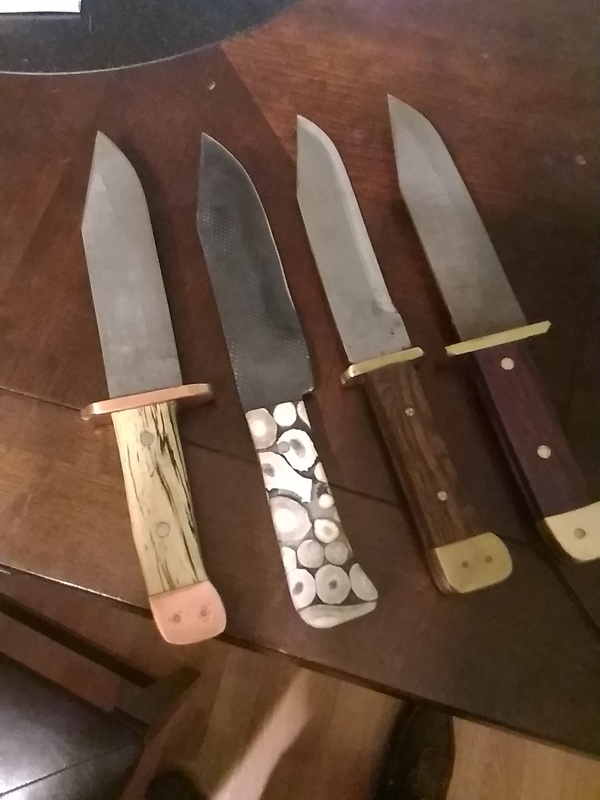 I’ve been smithing for a few years now and I’ve made knives of all different styles and sizes. You name it, but I realized (after I competed of course) that I didn’t really have a signature style. So I thought, and I pondered and I came up with a style that I’ve made before and it seems to really fit me and my style. It’s a smaller version of the traditional Bowie knife with a similar blade shape. I like a good, usable knife that looks really good. I like this shape and its easy for to me to reproduce. I plan on making them with a variety of steels. I’ve got some from Damascus, 5160 high carbon, repurposed farriors rasps, AR500. I’m also making them with a mix of handle materials. I will continue to make them as I feel the designs, but I’m always open to requests if someone has a particular mix of materials that they are looking for. The big question is, and I’d love to hear what it is…What is YOUR signature style? Most folks that follow us know that in addition to working to start our homestead, we are avid makers and crafters. In April Maria and I went to NYC so that I could compete on the History Channel show “Forged in Fire”. That was a pretty big deal for me. No, I haven’t heard when it will air, but yes I will let everyone know. Its driving me crazy in case you were wondering, lol. Well….I’m not the only one to get some famous recognition recently! 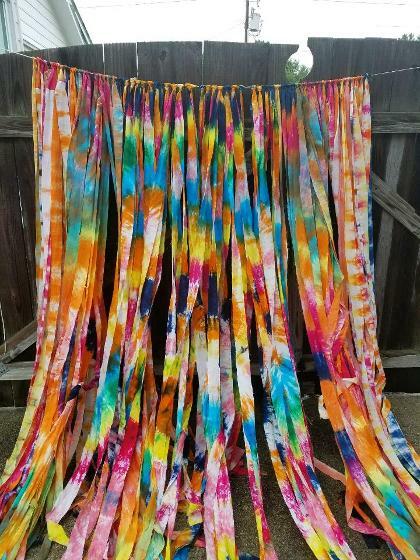 Maria got an order to make a couple HUNDRED feet of hand tie dyed hunting, and an 8 foot by 8 foot tie dyed door curtain for the Monterey International Pop Festival!!! It’s the 50th anniversary of the Summer of Love and they are celebrating that anniversary with another concert. And, Maria’s tie dye will be hung all over the place! How cool is that? She is super stoked and I am so proud of her! Here’s a photo of the door curtain before it went out. Doesn’t that say “summer of love”? We just wanted to share our excitement and we hope that you all have your own summer of love! Mudhole mystery solved, carpet bridge. The great mudhole mystery has been solved! Its not a spring, it’s a particularly clay heavy area of the soil. This keeps the water from absorbing. I’ve graded it enough to allow the water to run off into the existing ditch nearby. That’s the good news. The bad news is that there are several other areas with the same soil along our driveway. We haven’t had the water problems as the mudhole, but the problem is that when wet the water runs off without soaking in, causing the top 2 inches to be really gummy. 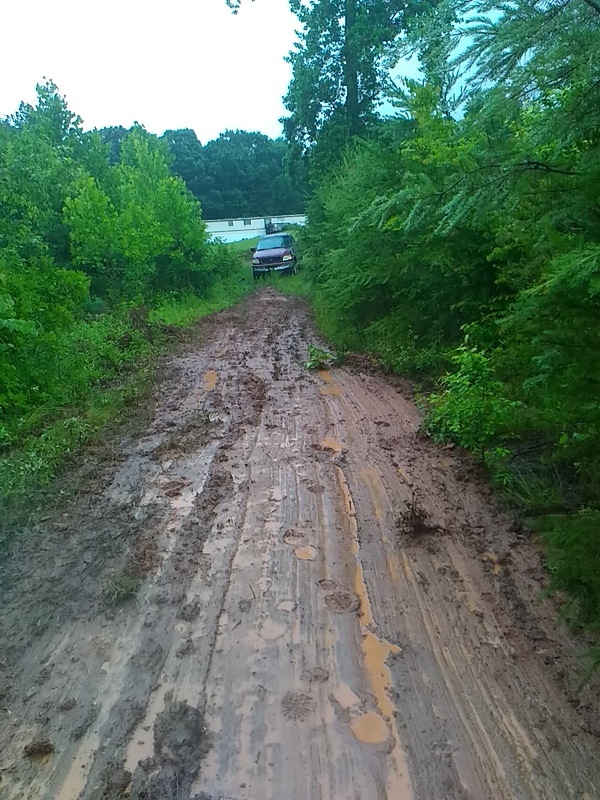 Its not too much of a problem if you just walk on it, but as soon as you try to drive anything across it the dry under section starts to get wetter, and the soup gets deeper. That means we can dig it out 12 -18 inches and refill it with rock and gravel ( which will cost a fortune), lay down some roadbed fabric and then some gravel ( also very expensive), OR we can follow the suggestion made by Dr. Wang from the University of Georgia and reuse carpet scraps as the roadbed fabric. 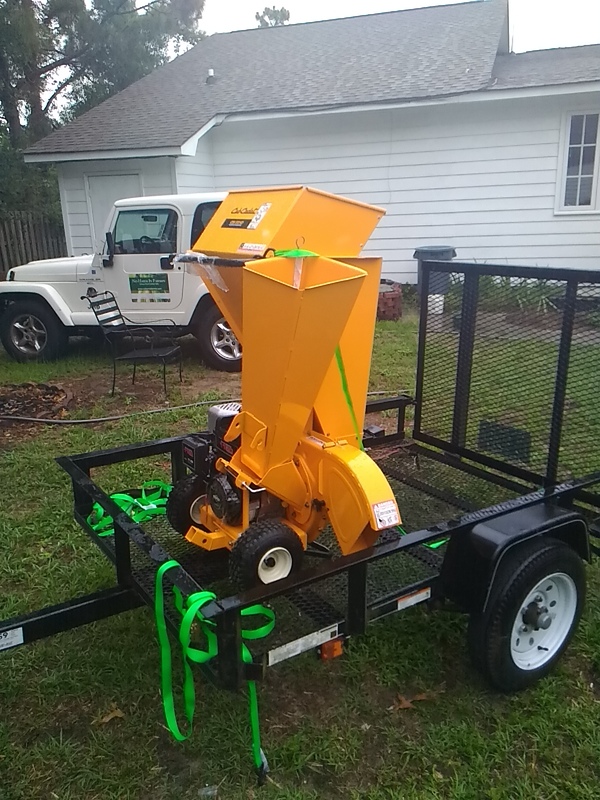 He completed a study to include several field trials to show that the use of old carpet under gravel can, and does stabilize soft and slippery soils to give a better load displacement under the gravel. Once I started to research this method I found an article put out by the EPA approving the use of carpet for the underlayment of both paved and unpaved roads, even up to Interstate Highways. The study showed that it could drop the cost of road construction 40 to 50 percent. It also show that less excavation and less fill material needed to be hauled. That has allowed for less green house gases produced from heavy equipment and trucks. Its solid underneath, but greasy as bacon on the surface and thats not even the worst mudhole. That’s just normal after the rain today! I’m going to do a small scale test on the carpet/gravel theory across the famous mudhole, but I think its a good solution. If I can get the driveway drivable, I think we can really make some progress on the cabin. 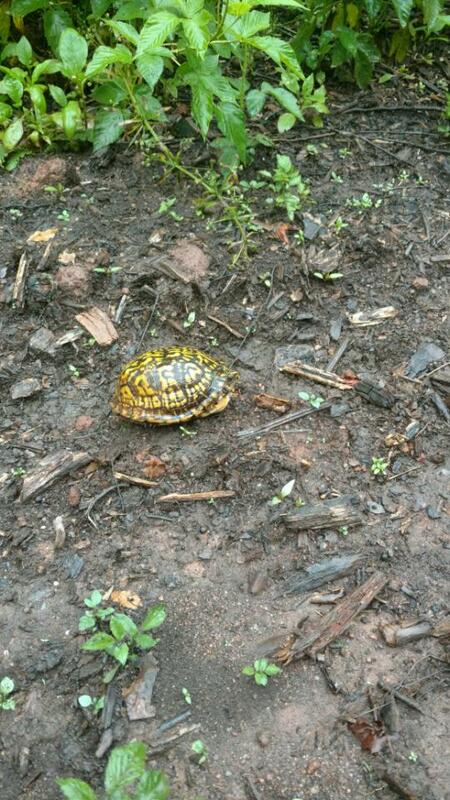 We did have a visitor today who seemed to be enjoying the driveway, muddy or not. He just decided to cruise on up the driveway. We hope that everyone has a great week.